Intex 32 x 16 x 4.3 Foot Ultra Frame Rectangular Pool Set w/ Pump and Ladder. This Intex 32 x 16 x 4.3 Foot Ultra Frame Rectangular Pool Set is the perfect mix of strength and value great for lap swimmers, pool games, and narrow backyards. Water capacity of 14,364 gallons when filled to 90 percent full. The contemporary design adds beauty to any backyard. Extremely durable and easy to setup. Includes: Debris cover, ground cloth, pool ladder, sand filter pump, set up and maintenance DVD. Make the most out of your summers and make a splash with the Intex 32 x 16 x 4.3 Foot Ultra Frame Rectangular Pool Set. The rectangular design is perfect for narrow backyards, lap swimmers, and pool games. The Ultra Frame design provides excellent durability and a sleek grey finish, all while making setup quick and easy. This pool includes everything you need for a great pool experience, including the powerful Intex 2,800 gallon per hour sand filter pump, ladder, debris cover, ground cloth, and installation/maintenance DVD. Swim your summer days away and have a blast in the water with this Intex 32 x 16 x 4.3 Foot Ultra Frame Rectangular Pool Set. Note: Requires flat, level ground for proper installation. Lay out pool liner on level ground, assemble the frame and fill with water. All rust resistant metal beams and joints snap together for fast, easy construction. Ready for water in 90 minutes. No sand or tools needed for setup. Intex 2,800 gallons per hour Sand Filter Pump is included to help keep your water sparkling clean with little maintenance. Does not require cartridge replacements. Built in GFCI (ground fault circuit interrupter) instantly shuts off pump if electrical current comes in contact with water making your swimming experience more safe. Lowest maintenance and most efficient method of pool filtration. Only requires routine backwashing and replacement sand every 5 years. An A Frame pool ladder is a perfect fit, complete with interior side barrier to protect your children while swimming inside. A pool debris cover keeps debris out of your pool and protects it from dirt, rocks and general wear. Instructional and maintenance DVD included to help you get started. Easy and convenient draining, drain plug accepts a garden hose to drain water away. Dimensions: 32 x 16 x 4.3 feet. Intex is the world leader in both designing and producing high quality, innovative products for indoor and outdoor recreation. Intex above ground pools, pool accessories, pool toys, airbeds, and boats are known around the world for their tremendous quality and value. All Intex products are rigorously tested and meet all international safety standards to provide years of fun for customers in over 100 countries throughout the world. Cancelling Your Order: Your order is important to us and will be processed immediately. Select the reason for the return. This listing is currently undergoing maintenance, we apologise for any inconvenience caused. 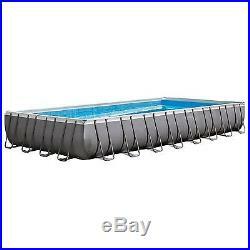 The item "Intex 32 x 16 x 4.3 Foot Ultra Frame Rectangular Pool Set with Pump and Ladder" is in sale since Monday, July 14, 2014.